Every wish you had one device that could hold your place in a dozen books at the same time? Consider investing in this 16th Century Book Wheel. Agostino Ramelli published his design for this massive mechanical reader in 1587. Having spent most of his life in a time of war, Ramelli was a military engineer who specialized in water-raising devices, military bridges, screwjacks and hurling devices, among other things. In The Various and Ingenious Machines of Agostino Ramelli, he wrote descriptions of his 195 inventions in both French and Italian, but he did not include any hint of how these machines might be built. His influence lasted into the 19th Century, and arguably continues today. Though this wooden machine was not built in his lifetime, he imagined the Book Wheel as a convenient way to cross-reference about a dozen books at a time. 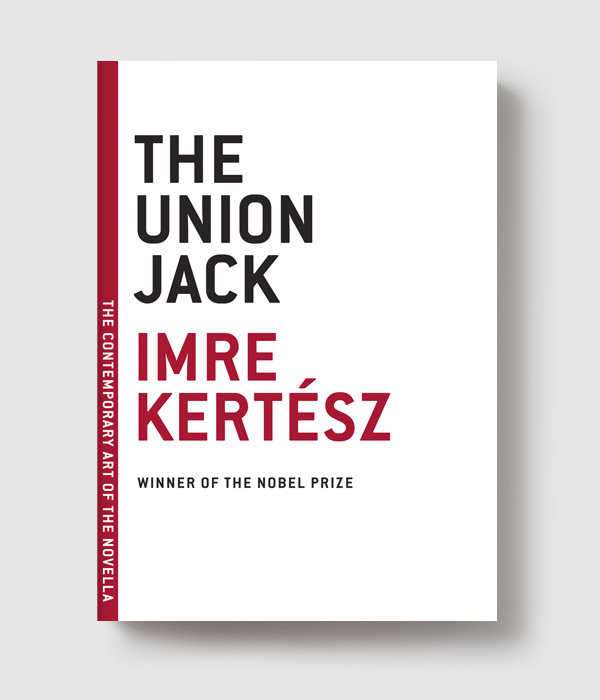 Rotating from one book to the next would not require closing the cumbersome covers of each volume; a heavy book would not need to be lifted down from a shelf, but remain open to its reader. It would employ Epicyclic gears like those of a clock, allowing each shelf to remain at forty-five degrees no matter how the wheel is positioned. 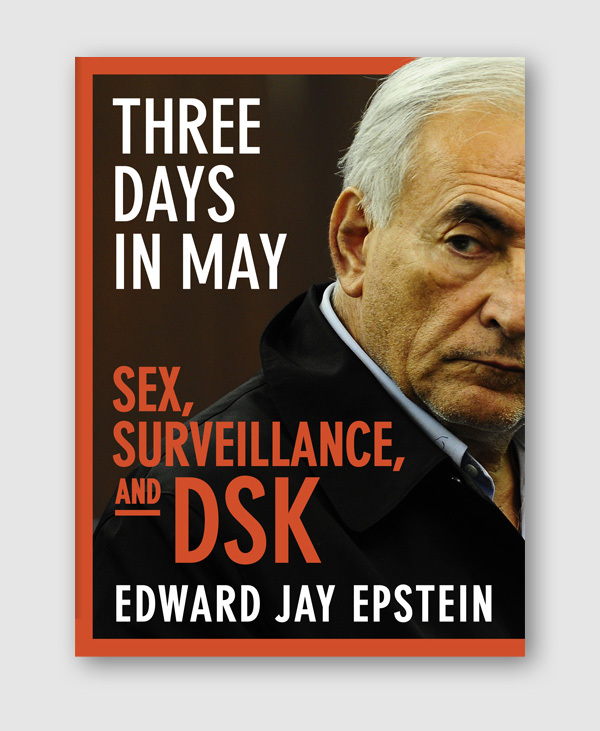 It could move up or down, much like a Ferris Wheel. This is a beautiful and ingenious machine, very useful and convenient for anyone who takes pleasure in study, especially those who are indisposed and tormented by gout. For with this machine a man can see and turn through a large number of books without moving from one spot. Moreover, it has another fine convenience in that it occupies very little space in the place where it is set, as anyone of intelligence can clearly see from the drawing. It’s just like keeping tabs open in a browser, except it would take up half of your living room. Believe it or not, this is pretty compact for its time. Its predecessor, the Chinese bookshelf of the 6th Century, was built on a horizontal axis rather than a vertical one. A few artists have tried to build a real Book Wheel in the more recent past. Notably, Daniel Libeskind had a crew of students put together his own interpretation of the structure for 1986 Venice Architecture Biennale. It was reverse-engineered from Ramelli’s designed and dubbed the Reading Machine. An interview with a former student of Libeskind, architect Hal Laessig, reveals that those who built the machine did not expect the wood to expand. Once they constructed it, they were alarmed to find it was not functional. 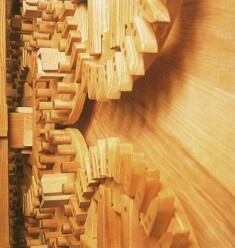 It took days to sand each piece of wood down until the gears would turn. Alarmingly, Laessig says the machine was destroyed by a firebomb. Historian Anthony Grafton keeps a Book Wheel in his Princeton office, from an exhibit he curated years ago. According to a profile in the alumni magazine, he keeps Greek, Latin, and Hebrew texts on it, as well as a copy of Eclipses for Humanists. 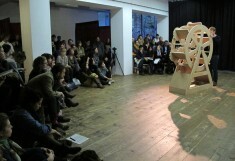 The Book Wheel was constructed in plywood last year by artist Léa Lagasse as part of a performance. The Awaken Dreamer included six texts by Nabokov, linked by associations and motifs, that were read aloud. 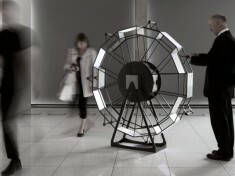 A piece exhibited last year at the Edinburgh Arts Festival employed the wheel’s design with screens in place instead of books. Called Drifts through Debris, the video art, dance and poetry displayed on the wheel reflected on the rise of oceanic plastic pollution. Critics have said Ramelli’s invention was a show of ego, as the design could have been completed with simpler gears. 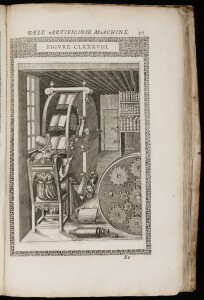 But his influence endures: the Book Wheel is considered the predecessor of hypertext, and this idea may have been the precursor to Memex, computers with dual screens like the Bloomberg Terminal, and car transmissions.